This article explains how to write pixel shaders for the Microsoft Silverlight and WPF platform with HLSL, as well as how to write an extensible Silverlight application for shader demos. Almost 10 years ago, Microsoft announced DirectX 8.0, including the huge real-time computer graphics milestone, Direct3D 8.0. Direct3D 8.0 introduced programmable shaders and gave the developers a chance to create never-before-seen effects and experiences apart from the fixed-function graphics pipeline. With Direct3D 8.0's new shader capabilities, it became possible to compute neat custom-rendering effects on mainstream graphics hardware. Today's graphics hardware is capable of running hundreds of shaders in parallel and modern games make heavy use of this technology t to achieve stunning effects. A shader is a rather small program, a so-called kernel function, typically executed in parallel for each data element. 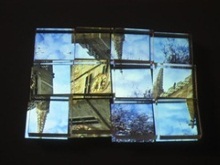 Pixel shaders, for example, are executed for each pixel of a bitmap, and therefore used to implement per-pixel effects. This introductory article will explain how to write pixel shaders for Silverlight and WPF, what tools should be used, and how to work with the tools. Furthermore, it will show how to build an extensible Silverlight shader application. 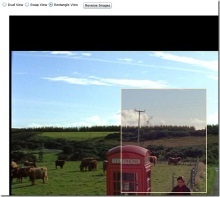 The demo application makes it possible to apply different shaders to an image or to the live stream from the webcam. The application not only comes with the two shaders that will be implemented in this article, it also contains three other shaders I've written before. The complete source code is licensed under the Ms-PL and can be downloaded from the CodePlex site. You need at least the Silverlight 4 runtime installed to run the sample and a webcam is needed in order to exploit the full functionality. The runtime is available for Windows and Mac. You can start and stop the webcam with the Button, or you can load an image from disk with the Button. Use the ComboBox to change the pixel shader that is applied to the source. Each shader has its own controls to change the used parameters. The controls should be pretty much self-explaining. Just try them out. When you click the Button for the first time, you'll need to give permission for the capturing. 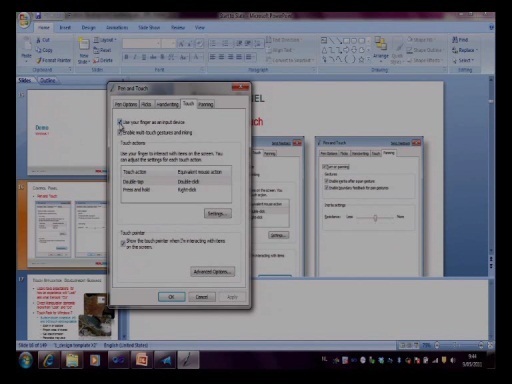 This application uses the default Silverlight capture device. You can specify default video and audio devices with the Silverlight Configuration. Just press the right mouse button over the application, click "Silverlight" in the context menu, and select the "Webcam / Mic" tab to set them. What do we have in Silverlight and WPF? 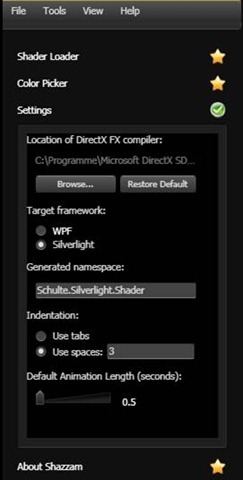 Pixel shaders were introduced with WPF 3.5 SP1, and later with Silverlight 3, as so-called ShaderEffects. 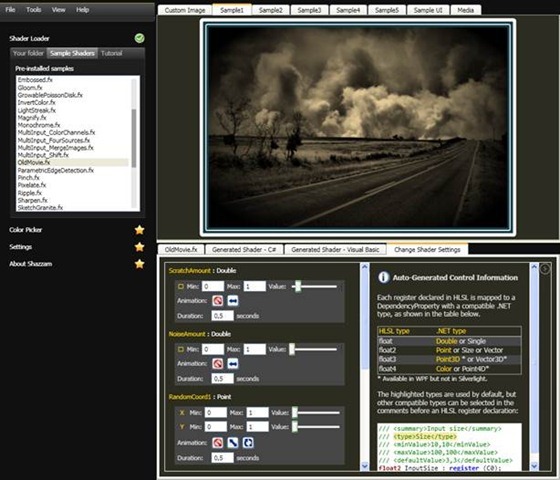 ShaderEffects can be applied to any control to create both nice visual effects and new user experiences. WPF 3.5 SP1 and Silverlight support the Shader Model 2, which is limited to a total of 96 instructions (64 arithmetic and 32 texture instructions). Modern DirectX 11 graphics cards already support Shader Model 5, which doesn't have such limits. Silverlight pixel shaders, however, are executed on the CPU and not on the specialized GPU. Since the software rendering pipelines make use of modern CPU capabilities like SSE and multi-core execution, they still run pretty fast and are the right way to implement effects in Silverlight. WPF renders the shaders slightly different. If the shader is applied to an element which is rendered on the graphics card, the shader will also be executed on the GPU. But if the element is being rendered for printing, certain TileBrushs are used or any other reason prevents hardware acceleration, the element and the shader will be rendered in software. This rendering is done on WPF's render thread and the software shader unit also uses fast SSE instructions like Silverlight's renderer, but does not take advantage of multiple CPU cores. WPF 4 supports Shader Model 3 with a much higher instruction count limit and these pixel shaders are only executed on the GPU. 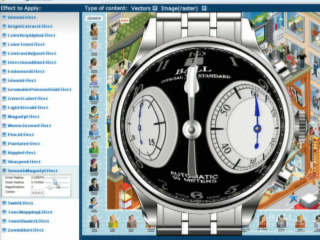 Due to the more complex computation there's no software rendering fallback. The shader will simply be ignored if it's applied to an element being rendered in software or the graphics hardware doesn't support Shader Model 3. This article targets Silverlight and WPF and therefore stays within the bounds of the Shader Model 2. There are several ways to write and compile shader programs. Nowadays, the most common method used in the Direct3D and Windows world is a language called High Level Shading Language (HLSL). The Direct3D shader compiler fxc.exe compiles the HLSL code into byte-code, which is then executed by the runtime. HLSL is a C-style language with some special data types and intrinsic functions, but without pointers. If you know how to write code in a C-style language like C#, you will quickly learn how to write a shader with HLSL. By the way, if you know HLSL, you also know NVIDIA's shading language Cg. Cg and HLSL have the same root and are very similar. The MSDN is a great resource for HLSL and provides detailed explanations of the syntax and functions. The following examples will make it clearer and the explanations should help to get you started. Of course, it's possible to write a pixel shader with a simple text editor and compile it with the command line tool fxc.exe, but there's a great tool available that makes the process a lot easier. 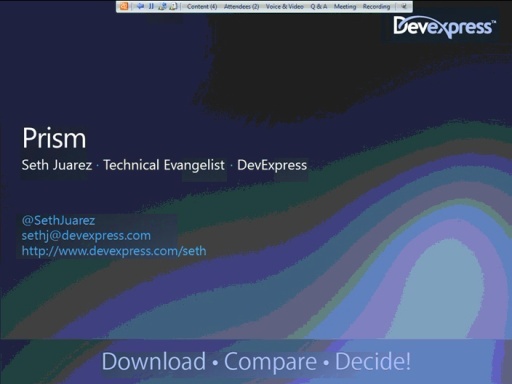 The Shazzam Tool by Walt Ritscher is THE utility for Silverlight and WPF shader development. It comes with an HLSL editor, which includes syntax highlighting, that compiles the shader and applies it right away to a sample input. It also generates controls for each parameter, which may be used to change the shader settings on the fly, and it creates the needed C# or VB source code file with a class that is derived from ShaderEffect. Download the DirectX SDK and install it. Download the Shazzam Tool and install it. After the Shazzam Tool is started, verify that the path to the DirectX FX compiler is set (Figure 2). The fxc.exe is normally located in the DirectX SDK installation folder under Utilities\bin\x86. 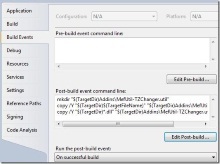 Also make sure the right Target framework is selected and a Generated namespace is set. To see if everything works, open a Sample Shader with the Shader Loader, select a sample tab page, and try the controls on the Change Shader Settings page (Figure 3). How to write a pixel shader? Now that we have the right tools installed and configured, we are ready to write the first pixel shader and the Silverlight application that will use it. The first pixel shader we're writing is a rather simple tint shader that converts the pixel into gray and tints it with a parameterized color. In the Shazzam Tool, select File à New Shader File, choose a location for the HLSL FX file, and name it TintShader. Shazzam will automatically create the basic pixel shader code, including a float parameter SampleI. Hit the F5 key to compile and apply the shader to the selected sample image. The input register is the actual bitmap / texture that holds the pixels and is sampled inside the pixel shader. This pixel shader main function is the entry point and is executed for each pixel of the input bitmap. The coordinate of the current pixel that is processed is passed as the float2 parameter uv. This coordinate is normalized to the range [0, 1]. The color of the pixel at the passed uv coordinate is sampled as float4 with the built-in tex2D intrinsic function. 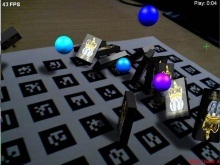 A float4 COLOR value is expected as the return value of the pixel shader. The initial pixel shader code returns the original color for each pixel and we use this as the starter for our gray scale conversion. The original color is sampled and then converted to gray using the dot product of the red, green, and blue values with a constant float3 vector. The result actually represents the luminance of the pixel. The dot product multiplies the elements of the color vector with the elements of constant vector and adds the three products, thus resulting in a scalar float value. The return value of the pixel shader is a new color made up of the gray value for RGB and the original alpha (transparency) of the sampled pixel. The gray conversion shader can now be extended to tint the output in a color that is passed as a parameter through a shader register. The color used to tint every pixel is passed as a parameter and therefore defined as the first register C0 (the next parameter should then be in the register C1). 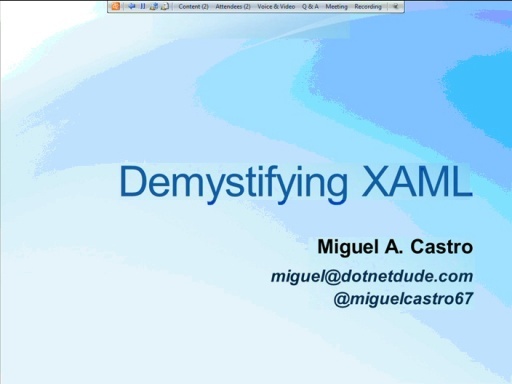 The XML comment is used by Shazzam to both create convenient controls and initialize the generated code. Shazzam creates the appropriate controls for the data type and uses the defaultValue, minValue and maxValue (Figure 6). The changed value of the control is applied directly to the Sample image, which allows a quick and easy shader development. Each element (RGBA) of the passed TintColor parameter is then multiplied with the float4 gray color and returned. 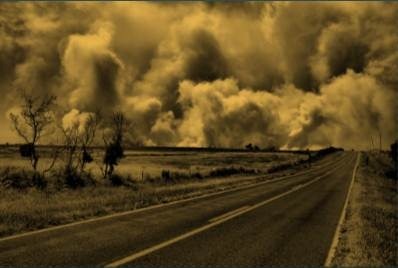 The result of the default TintColor values is a sepia-toned image (Figure 7). Now it's time to use the shader in a Silverlight application and apply it to an Image, MediaElement, or whatever UIElement you like. Start Visual Studio, create a new Silverlight Application project, and select at least Silverlight 3 as the target framework. In the Shazzam Tool, click on Compile Shader in the Tools menu and then on Explore Compiled Shaders. Make sure the Generated namespace setting (Figure 2) matches the assembly name of the Silverlight application. Copy the compiled shader file TintShader.ps and the corresponding C# or VB TintShaderEffect.cs|vb file from the GeneratedShaders folder and the CS|VB subfolder into the Silverlight project directory. In Visual Studio, add the TintShaderEffect.cs|vb and the TintShader.ps file to the project. The property Build Action of the TintShader.ps file must be set to Resource. Rebuild the solution. Open the MainPage.xaml file and add the namespace declaration and a Button or any other control that has the TintShaderEffect class applied (see below). Hit the F5 key and see your Silverlight shader application in action (Figure 8). 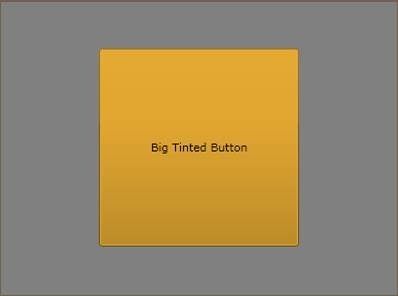 <Button Content="Big Tinted Button" Width="200"
That's all that's needed to get a pixel shader working inside a Silverlight application. Please note that no manual C# or VB code-behind was written. The second post process shader effect we'll write is a bit more advanced. It starts with pixelating the image before rounding the blocks until we've the final Mosaic-like result. For the development of this shader, we can use a different image. To do so, click the Open Image File menu item in Shazzam's File menu. 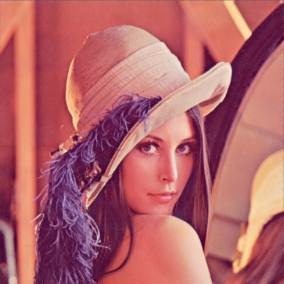 I used a famous test picture for image processing algorithms: Lenna. By the way, there's an interesting story behind this picture of Lena Söderberg. The float BlockCount parameter defines into the number of blocks (large pixels) into which the resulting image will be divided (pixelated). The size of a block (BlockSize) is the inverse of the BlockCount and calculated as static float to save some clock cycles. The coordinate of the current pixel (uv) is then used to determine the block to which it belongs. This determination depends on the BlockCount and is a result of the built-in floor function. To get the color of the output pixel, the center coordinate of each block is sampled for all the pixels that are part of the block. The Max parameter defines the maximum distance of a pixel to its block center and, therefore, the rounding of a pixel block. If the length of the vector between the current pixel coordinate (uv) and its block center is greater than the Max parameter, a transparent pixel (0) is returned. The built-in length function is used to calculate the scalar length of the distance vector. The last thing left to do in order to get some nice rings (donuts) is to add a test for the minimum distance. This is pretty easy and done with the additional Min parameter. Please note that all of the parameters can be animated, which could result in a nice (transition) effect when two images are overlaid. The Shazzam Tool also supports animation with the generated Shader Settings controls. How does the Demo Application work? The Silverlight demo application is quite flexible and can be used for many different shader effects without touching the core functionality. This last part of the article will show how this extensibility was achieved. Explanations of how to use the webcam with Silverlight and how to load an image from disk were detailed in my last Silverlight Face Detection article. 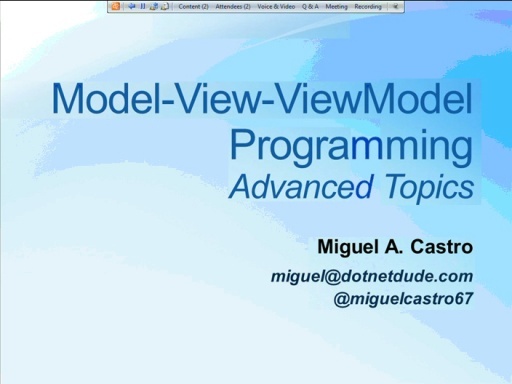 The application's extensibility was mainly accomplished by using the Managed Extensibility Framework (MEF) and a View-ViewModel approach for the shader parameters. MEF is a great way to make decoupled and flexible applications and has been part of the Silverlight framework since version 4. MEF is like Meth for .Net and Silverlight developers, but without all the undesirable side effects. The beauty of MEF is best illustrated using source code. 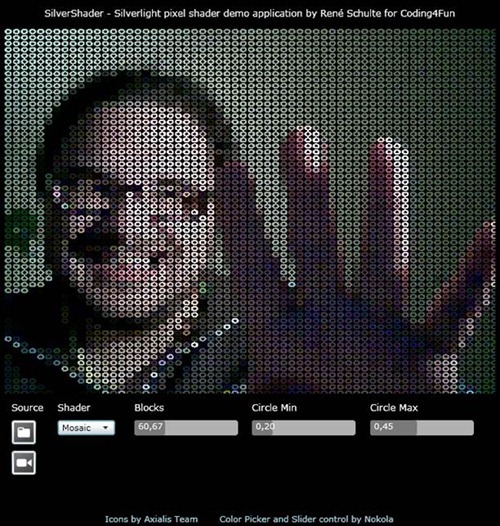 As you can see in the demo application (Figure 1), it's possible to select a pixel shader with a ComboBox. The items in the MainPage's shader ComboBox are populated through data binding an ObservableCollection <T> and MEF is used to build this collection. /// The main Page of the application. /// Interface of a ViewModel for a shader effect. The MainPage has a Shaders collection property containing items that implement the IShaderViewModel interface. This collection is initialized by using MEF's CompositionContainer with an AssemblyCatalog and the ComposeParts method. ComposeParts analyses all types in the provided Catalog (here, the assembly), checks if they have certain attributes attached, and wires these so-called parts together. To put it simply, an instance of a type decorated with an Export attribute is created and assigned to each field / property / parameter of the type that has an Import attribute attached. The IShaderViewModel interface has the InheritedExport attribute attached, which means that implementations of this interface will automatically provide that export. The Shaders collection in turn uses the ImportMany attribute, telling MEF to populate the list with all matching exports (here, all classes that implement the IShaderViewModel interface). After MEF fills the collection, it is data bound to the ItemsSource property of the ComboBox. 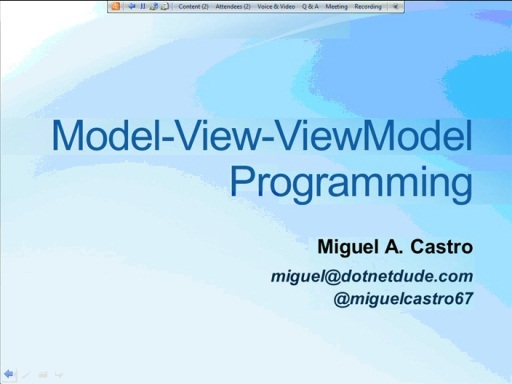 The Name property of the IShaderViewModel interface is used as DisplayMember. The advantage of MEF should be pretty obvious here: you have to implement an IShaderViewModel and maybe a View UserControl for the shader's parameters, but you don't need to add an instance of the shader ViewModel to the Shaders collection manually. Since the IShaderViewModel has the InheritedExport attribute attached, it's not even necessary to add a special MEF attribute to the new shader ViewModel type. Additionally, it's possible to load an extra assembly asynchronously and let MEF compose the parts and update the collection afterwards. By setting the AllowRecomposition parameter of the ImportMany attribute to true we're asking MEF to allow dynamic updates. As you can see, MEF is pretty easy but also very powerful. But we have just scratched the surface—this blog post and the MSDN are good starters if you want to learn more about MEF. There are many great HLSL shader development resources available on the web. The following list contains some sites focused on Silverlight / WPF pixel shaders. If I forgot a great resource, please post it in a comment. The open source WPF Pixel Shader Effects Library at CodePlex contains a lot of common pixel shader effects. Nikola Mihaylov (aka Nokola) wrote a great online image editor in Silverlight that uses pixel shaders for the effects. He released the pixel shaders that are used in EasyPainter as open source. And he also released the custom controls from his tool. The Slider and the ColorPicker used in the demo application are from there. I just changed some properties to Dependency Properties to make the controls bindable. So Kudos to Nikola! Walt Ritscher's amazing Shazzam Tool also comes with many cool pixel shaders as samples. Kudos to Walt for making such a great tool! Additionally, from time to time I write some shaders and put them up on my blog. Now that we have an extensible Silverlight shader demo application, I will surely integrate my upcoming shaders directly into it. While I was writing this article, an open source project called WPF Meta-Effects was released on CodePlex. The WPF Meta-Effects framework makes it possible to write Shaders for WPF in C# by using attributes, delegates, and dynamic HLSL compilation. It's a neat idea, but due to its dynamic compilation of shaders it's limited to WPF and can't be used with Silverlight. Additionally, I much prefer the simplicity of HLSL to C# when writing shaders. There's a reason why HLSL was invented: see the examples yourself. 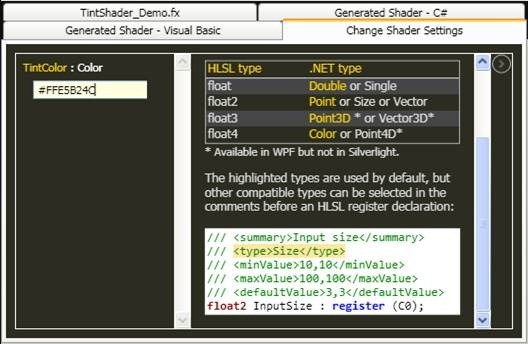 This article explained what shaders and HLSL are, as well as how to write pixel shaders for Silverlight and WPF. It also showed what tools / frameworks to use for the best developer experience and gave an introduction on how to write an extensible application with MEF. I hope it diminished any fear of the HLSL language and the shader development. I also hope it both inspires and helps you to write your own shaders. I'm eager to see what you come up with. Have fun! The links to the live demo app and source code are at the top of the article. Great article René. Thanks for the shout-out for Shazzam. FWIW, the next version of Shazzam with have a tutorial section, which should help learn the HLSL syntax. I love the Ring shader, very nice effect. @Walt: This sounds good. The tutorial section will be very helpful for beginners. Please feel free to include the mosaic / ring shader into the Shazzam samples. @Glenn: I know it's a cheap joke, but I couldn't resist. MEF is really great and addictive. Many scenarios where I'd normally use a DI / IoC container can now be implemented with the simplicity of MEF. Congrats to you and the team for getting this integrated into the FW. Full win! Curious if using these techniques will work for writing shaders for XNA as well? I wrote it to solve the annoying workflow issues with shader usage in WPF/Silverlight. Does the HLSL compilation (warnings/errors dumped to the error list), inclusion of the resulting ps binary blob file into the project, and generates the C# wrapper for the HLSL (with Shazzam comment style tagging to provide that extra bit of metadata needed when generating the C#). I guess you want to change the PixelsCount value with a Slider. You can not change the Width and Height of a Size. This is a Struct. You must call the constructor. Give it a try in the code and you'll see what I mean. PixelCountsHeight the other way around. but I have one question...maybe it is to early for me or I had not enough coffee..
/// The view model for the mosaic shader. It's very Nice Post, and it sees, have a greate potetial 4 development in Image processing field, dear Rene, do u have any advise 4 Iris Detection, i'm intersted 2 add Iris detection Capability, and even more improve it & using in mechanical engineering field. especialy in combined cycle thermodymic design, do u have any suggesstion? finally i should say again it's marvolous code. hope 2 hear ur advice. involving The CPU approach code, GPU Parallelism, and Batching the simulation where they describe Driving batches code. Towards the end of the presentation is brought to the fore Simple cloth: CPU and GPU, describing the characteristics, among which Vertex solver: a single batch, Improving the constraint solver: A branch divergence warning, DirectCompute – part of DirectX, Efficiently outputting vertex data: Creating a vertex buffer layout, Create a vertex buffer, Construct a UAV of other buffer. Finally, I want to ask if the programming code examples from the presentation, among which we mention the most important: The CPU approach code, Driving batches code, Creating a constant buffer code, HLSL – side buffers, HLSL kernel loops, they are presented in pseudocode or may be used in programming languages VC++ or Java.